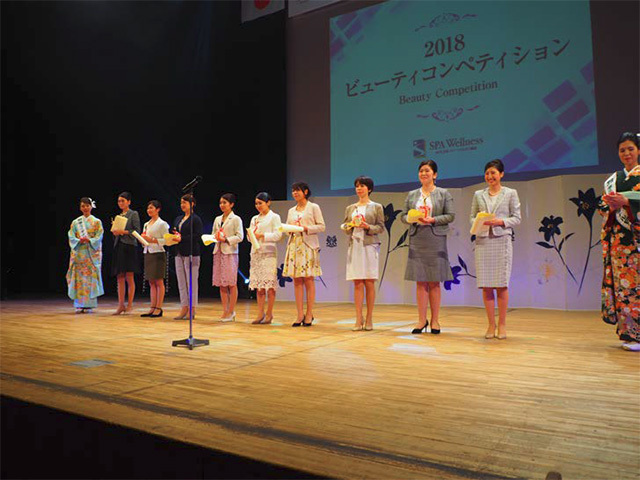 On Monday the 14th of may 2018, the ‘2018 Beauty Competition’ was hosted by the incorporated non-profit organization Spa Wellness Japan Association, and the following day on the 15th of May at the ‘15th Spa wellness Science Conference’ Miss Paris (location: Ginza, Chuo-ku, Tokyo, Representative Director Akemi Shimomura) aestheticians were awarded in the adult category. The 'Beauty Competition' is a tournament that aims at the acquiring of advanced aesthetic techniques and improving services. This time marks the 8th time the event has taken place. Structure in that the following categories, student body category, student facial category, adult (body and facial) category, all aspects are judged, of course aesthetic technique, but also grooming, consultation (analysis), and hospitality and customer service. This tournament is a high level competition between specially selected participants chosen from vocational colleges and aesthetic salons from across the country. Of which, the nine people who displayed the exceptional aesthetic technique and service were awarded. Miss Paris and Dandy House aestheticians received high praise for their superior technique and sincere customer service, receiving awards in the adult category. The Miss Paris Group will continue to provide service and techniques of there highest quality to make sure ‘beauty’, ‘health’ and ‘healing’ become a reality for all those who seek it. ■ The incorporated non-profit organization Spa Wellness Japan Association The Spa Wellness Japan Association was established with the aim of promoting the healthy development of the aesthetic industry and to improve the standing of aestheticians in society. In order to open the door to allow member aestheticians to acquire international qualifications, in 2013 Spa Wellness Japan Association joined the IPSN (International Professional Standards Network) as the representative of Japan, receiving IPSN ‘beauty therapist' certification. Other qualification exams carried out include diet professional, preventative care therapist, service manner, and beauty hair removal, and more, with many individuals across the country successfully passing the exam. Further, every year the ‘Spa Wellness Science Conference’ is held, which touches upon ‘beauty’ from various different aspects. We deploy a wide range of activities, from the diffusion of health spa and aesthetic salons, to activities that aim to nurture professionals with industry specific knowledge to play an active role in the world. 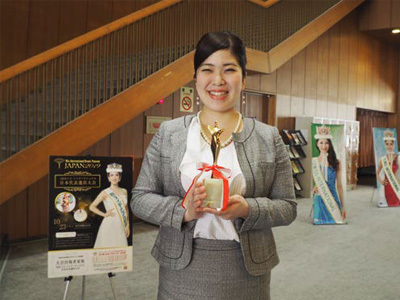 Ms. Misa Suzuri (Hiroshima PARCO salon) was awarded in the adult category. She was first awarded 1st place in the Student body category 3 years ago, making this time her second time to be crowned number one.